I am an award-winning writer, photographer, and teacher. I am also a traveler, by either heart or experience (sometimes I’m not sure which!) and I abide by a globally-minded feminist ethos in everything I do: by living carefully, living mindfully, and living compassionately. I write to inspire, to have fun, to catch interesting details and share them, to notice beautiful people, places, and experiences, to find beauty in the world where I can, and to teach other travelers to respect the places they tread and to think critically about the privilege of a traveling life. This is why I started Bon Touriste– to inspire and be inspired, to find beauty in our complex world, and to never give up the childlike wonder of traveling. Growing up in Atlanta, Georgia, the furthest I traveled was to California (once, I think, for my aunt and uncle’s wedding) and to New York to visit my grandma. My penchant for travel arrived, quite unexpectedly, during my college years at the University of Georgia: after a summer-abroad program that took me to the shores of lovely Valencia, Spain, I decided to pack up and move to the very small, intensely gorgeous Mediterranean island of Malta to work at an international English school, where I fell madly in love with Mediterranean pizza, the Maltese language, and my international cohort of teachers (many of whom I still travel with today!). After graduating from college, I accepted a position as a visiting English instructor at a university in the lovely and haunting Cartagena, Colombia. There, I learned to love empanadas, García Marquéz, dancing (though I’ve still got two left feet), a whole lot of Spanish, and, quite unexpectedly, teaching. 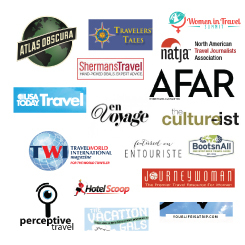 In addition to keeping up with my website, I edit a weekly interview segment with travel industry professionals, go on a number of international voyages and local trips each year, work with various media campaigns–both at home and abroad–and review hotels and creative or unusual accommodation options around the world. I love thinking about my responsibility as a traveler and my capabilities (as well as limitations) that come with this privileged and amazing work. I hope that comes through in my writing. When I’m not traveling and writing, I’m working on my graduate degree in Rhetoric & Composition and writing my dissertation on contemporary tourism and digital media practices. If you’re into such scholarly things, I invite you to read more about my dissertation project on my Dissertation page! I lived in the lush and beautiful Sonoran Desert in Tucson, Arizona for eight years with my incredible husband Ryan, who is an artist, a graphic novelist, and a poet (check out his co-run literary journal of experimental poetry, The Offending Adam). When we weren’t working, we’d take a quick jaunt down to Mexico for the weekend with our best friends for fresh mangoes, sandy beaches, and lots of Spanish. I, of course, did most of the talking (and I love it). After dating for six years, Ryan and I finally got hitched in a little garden ceremony in the summer of 2013 at The Thursday Club–a women’s philanthropy club–near the Sunset Cliffs in San Diego. Since I studied abroad in Spain during college ten years ago, I have made enough money scrimping by and taking part-time and freelance jobs to travel to over 35 different countries. That number still amazes me. As someone who is not independently wealthy or getting someone else to foot the bill for me, I am humbled and honored to do this work I do–and I hope it carries me through for the rest of my life. I’ve spent time living and teaching in both Europe and South America, and I’ve traveled throughout North America, the Caribbean, and Asia. There’s still so, so much more to see. What Do I Believe About Travel? I am, first and foremost, an independent traveler (although I do participate in FAM trips–that’s industry lingo for press trip–a few times a year). I believe in traveling slowly, in savoring moments, in trying new languages, in getting lost for no particular reason, in visiting those little-known places, in leaving positive impressions, in finding laughter in unexpected encounters. I believe in participation, in immersion, in confusion, in giving up what we can to gain the beauty of new experience, and in looking forward to those unexpected meaningful, memorable moments that happen when we simply let go and live. I believe in learning about local foods, working sustainability to leave small footprints, and connecting with local communities. And I am committed to helping other curious people believe that they, too, can make their dreams come true. And I can’t wait to meet you and hear about your journey, too! Email me at kristin [at] kristinwinet [dot] com if you’d like to chat, get some advice on traveling, or just share tips, books, or awesome resources. I’d love to hear from you!